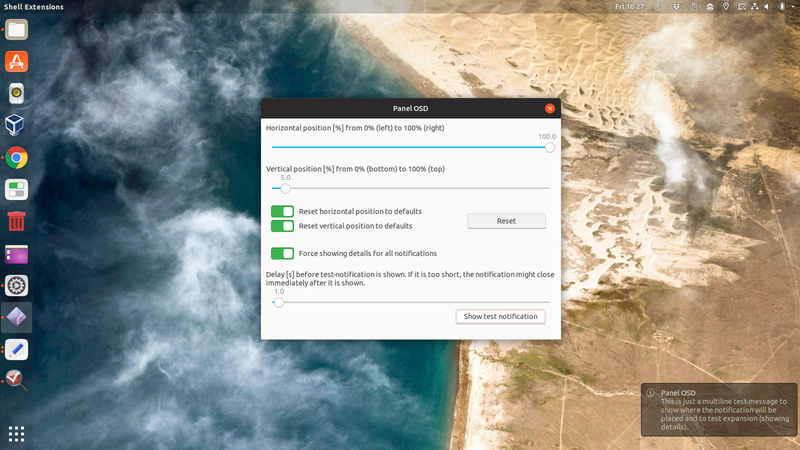 Looking for a way to change the notification bubbles position in Gnome Shell? The easiest way to do this is probably using the Panel OSD extension. 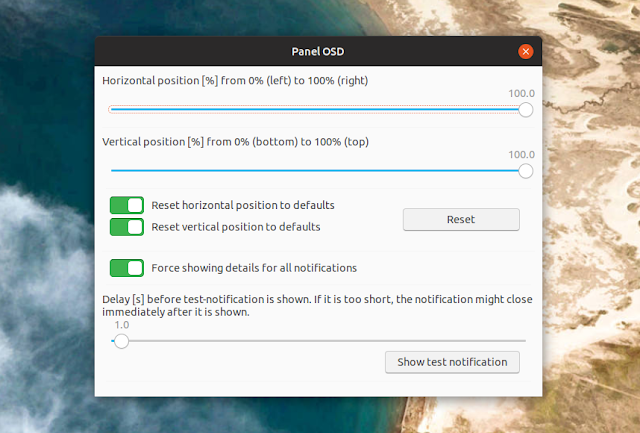 Panel OSD lets you position Gnome Shell notification bubbles anywhere on the screen, thanks to its two sliders which allow setting the exact horizontal and vertical position of the notifications. The extension also allows forcing notifications to be displayed expanded, without requiring a mouse over. While it does its job well, the extension is very basic and lacks some more advanced features, like multi-monitor support. Right now, you can only position the notifications on the primary monitor using Panel OSD. An option to configure the notification bubbles transparency is another feature I would have liked to see in Panel OSD extension, but which is unfortunately missing. This can be done using another extension called Transparent Notification , but it doesn't work with any Gnome Shell theme. Regarding the Transparent Notifications extension, it automatically sets the notifications transparency to 50% and there's no option to change this, but you can manually adjust the transparency level by going to ~/.local/share/gnome-shell/extensions/transparentnotification@ipaq3870, opening stylesheet.css with a text editor and editing the transparency value from that file (and then restart Gnome Shell). An important thing to note is that Panel OSD is that it doesn't play nicely with the Unite (an extension which makes Gnome Shell look and behave more like Unity desktop) extension for Gnome Shell. That's because Unite forces the notification bubbles to be displayed in the top right-hand side of the screen. If you have the Unite extension enabled, Panel OSD will only be able to adjust the vertical notification bubble position. As a side note, if all you want is to display the Gnome Shell notifications to the top right corner of the screen, you can use the Unite extension as well. To use Panel OSD to change the notification bubbles position on your Gnome Shell desktop, open the extension Settings either using the Gnome Tweaks application (Extensions > Panel OSD) or the Gnome extensions website, and drag the horizontal and vertical sliders to the position where you want the notifications to be displayed, then click the Show test notification bubble to test your new settings. If you want all Gnome Shell notifications to be expanded by default, without having to hover with your mouse over them to see the complete notification text, enable the Force showing details for all notifications option.